As the General Election draws closer, the Right2Water campaign is stepping up its anti-water charges campaign by holding a nationwide demonstration this Saturday, including in Galway. The Right2Water Galway demonstration starts at 2pm in Eyre Square with a march to the Spanish Arch. It will be one of 30 such demonstrations across the State, and the organisers are calling for the public to take part in large numbers, "to demand that the quango Irish Water be dismantled, and that water is constitutionally enshrined as belonging to the people of Ireland and never privatised." Said R2W Galway's Dette McLoughlin: "The water movement has raised the confidence of people suffering under years of austerity and a neo-liberal agenda. We have already forced the Fine Gael/Labour Government to make concessions, including lower water charges. People power is about mobilisation and protest. It’s the protests that give people the confidence to continue with the challenges ahead, and sends a strong message to the politicians. We haven't gone away!" More than half of all the water charges bills remain unpaid and public disaffection with the controversial Irish Water remains high. As a result, Ms McLoughlin is calling on the public to "stay strong and determined". "This is the most important fight this nation has seen in a very long time, one that must be won!" she said. "We must ensure water remains in public ownership and be available for everyone in the future, no matter what their financial circumstances. Water is too vital for life to be allowed be put into private hands." 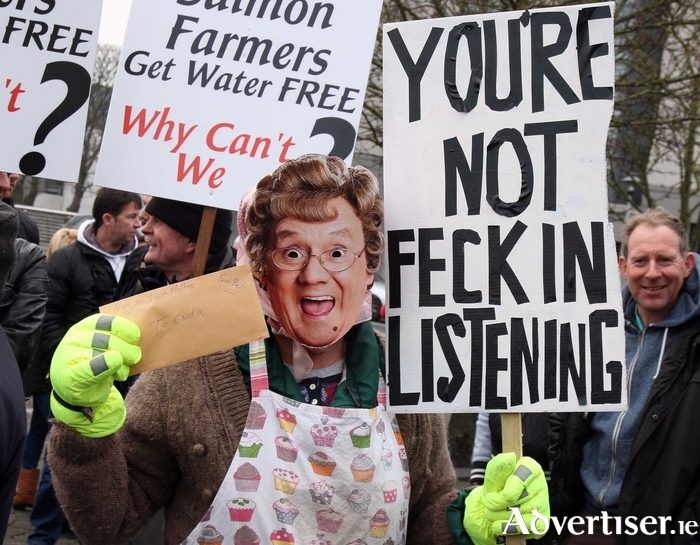 Another day of national protest will take place closer to the General Election.